This interesting and unusual name is of early medieval English origin, and is a metronymic (from the female/mother) of the name "Anastasia", itself from a Greek word meaning "resurrection". Anstiss, Anstish, and Anstyce, all occur frequently as female names in the older pages of West Country documents, for example Anstiss Symons, who was recorded in the Register of St. Columb Major, Cornwall, in 1616. Only a handful of surviving surname were derived from the name of the first bearer's mother. This is because European society has been patriarchal throughout history, and as a result, the given name of the male head of the household has been handed on as a distinguishing name to successive generations.Examples of recordings from Devonshire Church Registers include: the christening of Gregory, the infant son of John Anstiss, on March 27th 1705, at Marldon, and the christening of Ann, daughter of John and Mary Anstiss, on February 13th 1736, at Crediton. 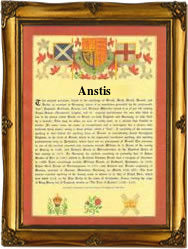 The modern spelling forms include: Anstiss, Ansteys, Anstice, Anstey and Anstis; Christopher Anstey being a Fellow of Cambridge (1724 - 1805), whilst, earlier, John Anstis (1669 - 1744), was Garter King of Arms to George 1. The first recorded spelling of the family name is shown to be that of William Anastasie, which was dated 1222, in the "Feet of Fines of Buckinghamshire", during the reign of King Henry 111, known as "The Frenchman", 1216 - 1272. Surnames became necessary when governments introduced personal taxation. In England this was known as Poll Tax. Throughout the centuries, surnames in every country have continued to "develop" often leading to astonishing variants of the original spelling.